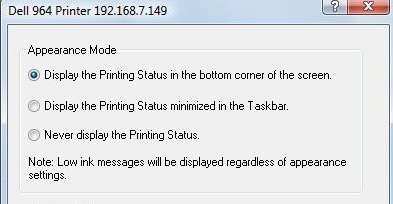 This is where you will be given the option to change the “Appearance Mode” to display a minimized print status in the task bar or to not display the print status at all. Make the decision you think will work best for you. Keep in mind, though, if you opt to turn the status updates off all together, this means the real “Low Ink” messages will no longer appear either. The above instructions are a way to bypass the error message, but to tackle the underlying issue, you may want to consider cleaning the cartridges, printheads, and sensors. You can run the internal cleaning system first, but if the error message is still coming up, refer to Cleaning an Inkjet Printer for detailed instructions for safely cleaning your machine.